Hamburg’s Metalium was formed in 1998 and played traditional and true heavy metal. The band was initially signed with Lars Ratz’s Armageddon Records, before getting licensed to the Massacre label. The band’s albums were named in order as ‘chapters’ with Millennium Metal being Chapter One and the farewell piece, Grounded, being Chapter Eight. Two DVDs in 2001 and 2006 were respectively called Metalian Attack Part 1 and Part 2. Metalian, the metal hero, was a repeat character within the band’s concept including its debut album. Terrana joined Rage following the release of the debut. The album was supported through tours with Primal Fear and others. Mark Cross was the next drummer, but would not last either. State Of Triumph featured a guest appearance by Jutta Weinhold of Zed Yago was a companion of Ratz at one point. Chris Caffery wanted to concentrate on Savatage and left the band in early 2001. Jack Frost replaced him. Mark Cross was struck by the (EBV) Epstein-Barr virus in 2003 while in Helloween. Don Airey would often help on keyboards. In the song Find Out on As One a duet between the Metalian and Metaliana features Japanese female singer Saeko Kitamae from Osaka. She later recorded for Armageddon Music and appeared live with Metalium as she was managed by Lars Ratz. In the spring of 2006 the Metalium pair of Lars Ratz and drummer Michael Ehré would be in the formative line-up of Apolon, a side-project. In March of 2007 Firewind singer Apollo Papathanasio had cut short touring with the band due to a family emergency. Henning Basse was filling in. Incubus was issued in the summer of 2008. The same year brought several tenth anniversary shows. The group announced its death in September of 2010. Several European farewell shows were announced. An EP was also promised. Former Metal Church singer Ronny Munroe released a solo album, called Lords Of The Edge, on October 18th, 2011 through Rat Pak Records. 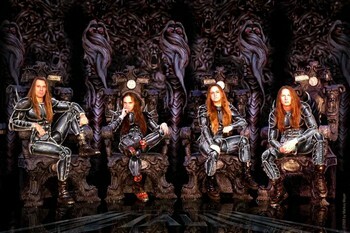 The album featured guitarists Chris Caffery (Trans-Siberian Orchestra, Savatage and Metalium), Stu Marshall (Empires Of Eden) and Michael Wilton (Queensrÿche). Ehre replaced drummer Zimmerman in Gamma Ray in mid-2012. As of late 2015, Basse was recruited into Firewind full-time. Only Germans can write quality speed metal like this! It is amazing, right from the first note on opener Steel Avenger one knows that this is melodic speed metal as it was, is and shall always be. Building on a solid sound and performance, the revamped line up of Metalium plunges head first into a symphonic metal fest deserving of its fast-rising reputation. Strangely this sophomore conceptual effort hasn't been receiving the same positive nod as its predecessor, but the high-pitched vocals (a la Queensryche/ Jacob's Dream,etc) and powerful musicianship are convincing as is the concept of the metal warrior Metalian (a gross misspelling? On the other hand there is only one The Metallian). The band presents the listener with both barn burners and metal ballads as befits the concept of the story and overall delivers a respectable metal opus for your listening pleasure. - Ali "The Metallian"
As One - Chapter Four - is Metalium's fourth album. The revamped line-up of the Germans sticks to its formula of making solid metal with screaming vocals and pounding songs. The musicians are in good form and continue the saga of the Metalian (clearly an impostor to the one and only Metallian) from the band's last album by introducing his companion, the foxy Metaliana. Both are given voice within the adventure and come to life both as persons and as subjects of the saga. The story has occurred some 3,000 years ago and is interesting to follow. Sadly, the lyrics are hard to read given the booklet's layout. Where Metalium forfeits points is in the sound department. The production is not cohesive and the drums and bass occasionally sound apart from the rest of the pandemonium. Notwithstanding that obstacle, Metalium is a very good band that proudly waves the flag of heavy metal. The band's concept story and production shackle As One... to some extent, although the album remains a good choice for most. - Ali "The Metallian"
Metalium is a nifty heavy metal band with a knack for belting out genuine heavy metal. The band with its proud metal credentials is tight, heavy, pure and even counts a couple of really cool guys with long manes - yummy - in its ranks, yet, and in all honesty, something is still missing.